The protection of the Kissimmee River watershed is essential to ensure clean water as we face the future in south Florida. Seven million Floridians live within the Everglades watershed. That number has doubled since 1970, and is projected to double again by 2060. Against this outlook, it will be a challenge to ensure a future for the Florida panther, or the whooping crane, or the snail kite. But in addition to the myriad species in need of protection, clean drinking water for humans is a major reason to pursue the protection of the entire Everglades watershed. Those who are unaware of Florida’s wildlife and wild landscapes are still bound to the land by their use of water. It is spectacular dry prairie: lots of wild flowers, lots of native grasses, all healthy and very lush. There are rabbits everywhere, you can hear quail, and see turkey, and it looked like a panther could emerge any moment. Water enters the Everglades through multiple inputs, but the Kissimmee River and the Kissimmee Chain of Lakes have been the focus for engineers and ecologists over the past decade. Through the Comprehensive Everglades Restoration Plan (CERP) 24 miles of meanders have been restored to the Kissimmee River, correcting 1960s channelization of the river that drained the land for agricultural use. The result is a return toward achieving the natural filtering effect of the regions wetlands, removing excess nutrients from runoff, so that water flowing into Lake Okeechobee is cleaner. By conserving the land around the Kissimmee we improve the quality and quantity of water for central and south Florida. Fortunately, the effort to protect the Everglades headwaters does not start from scratch. 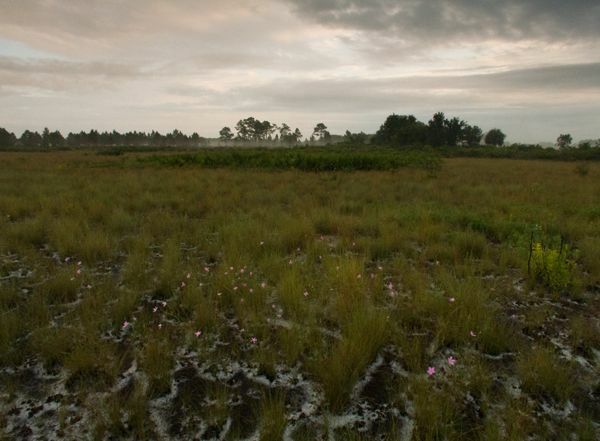 Years of hard work by landowners and conservationists have given us Kissimmee Prairie Preserve State Park, Avon Park Air Force Range, and Three Lakes Wildlife Management Area, among others. These three reserves alone account for over 220,000 acres. However, the gaps remaining in the Kissimmee River corridor are important ones that must be protected soon, or risk being developed when another housing boom sweeps into the Florida heartland. The Pine Island Slough Ecosystem Florida Forever BOT project is an ambitious effort to add nearly 49,000 acres to the protection of the lands around the Kissimmee River. The project would strike a major blow for central Florida’s precious dry prairie and grasslands. The block of protected land that would result from the protection of Pine Island Slough would stand among the largest conservation networks in the state, protected by a partnership of agencies and each accessible to the public. Pine Island Slough sits on the east side of the Kissimmee River, where it borders Kissimmee Prairie Preserve State Park. The Florida Forever project designed to protect the slough encompasses a large, intact landscape of incredible ecological riches. From birdlife to rare plants to the all-important freshwater marshes, to the breathtaking expanse of prairie, the landscape is an ecological gemstone. There are pine flatwoods with red-cockaded woodpeckers and eastern diamondback rattlesnakes. There are both wet and dry prairie habitats, supporting the largest diversity of grassland flowers on Earth. There are stands of scrubby flatwoods and ancient Florida scrub, where the Florida scrub jay and large flowering rosemary may still be found. Despite the ecological treasure, the site is vulnerable. As recently as 2009, the Pine Island Slough Ecosystem was slated to be the site of a new town, ironically named Destiny. There were plans for housing to accommodate up to 200,000 residents, spread over 40,000 acres. Given the speed with which some Florida landscapes have been developed over the last century, it is not hard to envision this property disappearing one day soon. Some of the cowmen that work the prairies of central Florida were alive when most of current-day Orlando was a ranchland. The question is not whether a similar scenario could play out again near the Everglades headwaters. It’s a question of “when.” Squabbles between the developers have delayed the Destiny project roll-out, but there can be no doubt that the issue will arise again. Unless we protect it.